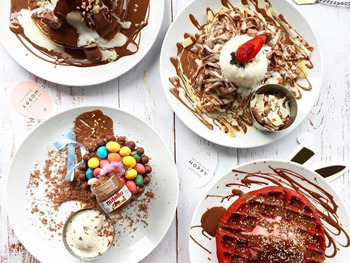 Residents of Sydney's West should prepare themselves for not one but three Tella Balls Dessert Bar (TBDB) openings across Castle Hill, Wetherill Park and Liverpool, following the successful launch of the Nutella dessert franchise in QLD last year and NSW in 2016. For the first time, TBDB will also be serving savoury crepes with choice of southern fried chicken, falafel and Australian Angus beef patty and steak fillings. Co-Owner Aki Daikos comments, "It is both the success of the first seven stores and the demand we've been receiving from Western Sydney residents on social media that has led us to open three new stores in that area. We're also excited to offer customers a well-rounded experience at Tella Balls by finally offering savoury meals!" 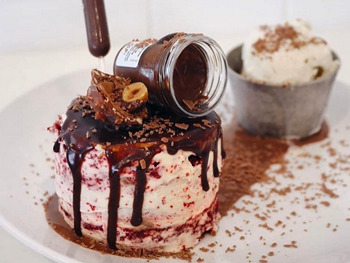 "There is a large demand for insta-worthy desserts, and we're thrilled to reach more foodies alike to offer them desserts that have never been done before in this market, including our signature dessert fish and chips and dessert lasagne, and our newly launched over-the-top confectionery desserts like the Coco Pops Waffles, Reese's Pieces Crepes and Wagon Wheel Pancakes." There is no slowing down for Australia's newest dessert chain, with Daikos commenting, "All of these openings are what we hope to be an empire of Tella Ball bars. We've had lots of interest across the States, the UAE, Iran and Malaysia. That's where we're heading soon. For 2018 though, we expect to see more doors open across Penrith, Ramsgate, Sutherland Shire, St Ives and Mona Vale. Our followers are speaking, and we're listening!" Also new to the menu includes Tella Balls topped in Fruit Loops, Maltesers, Toblerone, Wagon Wheels and Caramello, as well as Nutella gluten-free cake, Golden Gaytime Tella Ball Slider, Reese's Pieces Waffles and dessert mezza – a trio of milk chocolate dipping sauces with marshmallows and fresh fruit. For more information, visit @tellaballsdessertbar on Instagram and Facebook.